You’ve tried the LAW of Attraction, watched & read “The Secret” but still nothing you are manifesting has come about! “Something” is holding you back from creating this. 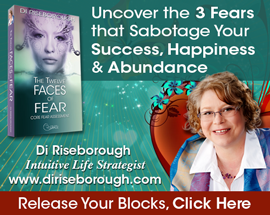 Maybe it is Hidden FEARS you are sending out unconsciously that’s messing with your mojo and creating confusion and the stuff you don’t want in your life. Imagine creating what you want with this simple method and the healing aspects of the energy I bring to this workshop. Just check out what many are saying how this process has changed their world. We are too often so absorbed in making a living, that we do not take the time to create a life. And time is exactly what it takes to create a vision for what you want to have, to be, or to do with your life. What if you could hear the ‘Secret messages” from your Soul? In business and life it’s never to late to create a vision. You know the old saying “Vision without action is merely a dream. Action without vision just passes the time. Vision with action can change the world”. Imagine what it would feel like getting clear on what you really want to get out of life and attract it? Imagine knowing what your sense of purpose looks like…IMAGINE….. Yesterday was my first TV interview! Yes, me actually going on TV and sharing with everyone my story about Face of Hope. Those who know me well would never imagine me doing this, including myself. I was thinking yesterday, How am I able to face such a huge fear of mine? Well back in Nov. 2012 I was invited by my friend Maureen Harrison to attend a Soul Vision Collage Workshop with a beautiful woman named Di Riseborough and honestly that’s where it all began. I experienced huge breakthroughs in this amazing workshop and I was so inspired by Di that I’ve been working with her ever since. She has helped me to reconnect with me vision and purpose for serving this planet and I am grateful everyday for her guidance. I am consumed with immense joy as I watch pieces of my board coming true and I’ve never been happier. This vision collage isn’t like any you have created before. Put simply, a vision collage is a paper board on which you glue carefully selected images, words and phrases with intention and emotion. This is a Potent interpretation of not just what you wish to manifest, but more importantly, the feeling and joy you wish to experience. In this powerful workshop, you will learn how to set clear, strong intentions on what you want to manifest in your life. Without clarity, you are sending a vague concept out into the universe when manifesting. Therefore if you only send out vague desires, you will only receive vague results. The more clarity you have, the better! Where intention goes, energy flows! What makes this process DIFFERENT than a ‘normal vision board’? I took Di’s Soul Vision Collage Workshop last fall. What a life-changing day! As I put the board together, I felt myself really listen to my heart and my soul’s purpose. When the board was complete, Di offered some fabulous insights and words of wisdom. I felt my life’s path unfolding before me on the board. I meditated in front of that board for months and because of that vision board, because of Di’s encouragement to follow my bliss, I have opened a business and followed a lifelong dream. Di has tremendous gifts and we are all so blessed she is sharing her talents with the world. Her Soul Vision Collage Workshop is like no other. I have taken this workshop twice and EVERYTHING my soul chose for the boards has come forward and come true. If you want to learn how to listen to your heart, learn more of what you are really meant to do, learn how to live your life more richly and more on purpose, take this workshop. Your Board Might Even Reveal what Conflicting Intentions are Preventing YOU from Getting What YOU Want!!! Before taking Di’s Soul Vision Collage workshop I saw the Vision Board process as simply as putting things I want to manifest in my life. And felt it would help me to be more inspired me to work my business. Since taking her course I discovered that there is a whole lot more meaning behind what goes on my board with Di’s guidance – choosing images and words that speak to me and touch me emotionally are so much more meaningful than just looking for things I want. Not questioning the pictures and phrases but trusting my instincts and placing them on my board becomes so enlightening when guided by Di throughout her workshop. I left the workshop feeling so empowered to move forward in the direction of what I truly want to have manifested in my life – a clearer vision of not only what I want, but why it’s important to me and by putting action to my soul vision board in doing the things that will truly make a difference it also reveals what I can look forward to on an emotional level. Thanks so much Di for your insight and your guidance!!! This Soul Vision Collage® differs from other Vision Collages. Using a specific method, I guide you through your images, feelings and insights so you can discover the hidden messages your soul wants you to know. You will then learn how to anchor your messages, your vision and intentions into your physical world ten-fold! Bring a journal, pen and a water bottle. If you have any pictures already please feel free to bring them to add to your collage. We hate spam too and strive to deliver valuable content to you occasionally. We respect your privacy, and your contact information will NOT be sold or otherwise given away. Copyright © 2018 Di Riseborough. All rights reserved.